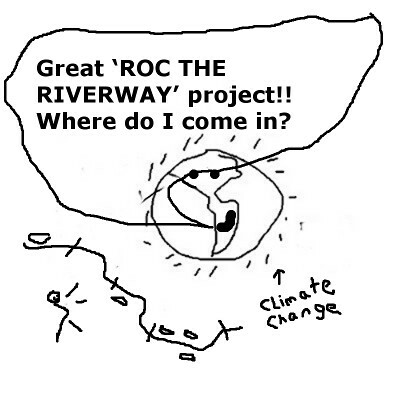 Rochester, NY’s ‘ROC the Riverway Program’ offers our community an incredible opportunity to take our Climate Action Plan (CAP) to the next step. Not only does the ROC the Riverway Program incorporate many of aspects of the CAP’s Land Use policies—Coordinated Land Use and Transportation, Transit-oriented and Mixed-Use Development (TDD), Redevelopment of Brownfields and vacant or underutilized properties, Urban Agriculture, EcoDistricts, and Parks and Open Space Planning—it presents the City with a concrete example to encourage other communities to do more to address and mitigate Climate Change in their regions. Within the scope of the ROC the River Project—South River, Downtown, and High Falls--are many past, present, and future environmental issues that must be addressed. Cleaning up both the Genesee River (in conjunction with the City’s Local Waterfront Revitalization Program (LWRP)) and the old Vacuum Oil Brownfield site (Vacuum Oil Brownfield Cleanup Program, with the highest level of cleanup), must be included in the City’s vision. Resuscitating these places of historical environmental misuse and reinvigorating them will make our community more healthy and better able to adapt to Climate Change. And, with the many attractions suggested by the ROC the Riverway Project, tourists are more likely to enjoy and learn from this project. Repairing and updating the bike trails, bridges, and pedestrian walks throughout the ROC program will ensure that this active transportation (walking and bicycling) corridor enhances the beauty and helps mitigate the effects of greenhouse gas emissions. If more people are able to walk and bike through our downtown hub, it is more likely they’ll live a healthier lifestyle and choose this section of the City to live, work, and play. Not only should ROC the Riverway be developed with Climate Change in mind, the project should be a showcase for adapting and mitigating Climate Change as an inspiration for other communities. That is, Climate Change should be communicated as this project’s priority. In no way should this be a ‘no-regrets project’, where even if you think Climate Change is a hoax, it’s still good. It should be presented as a Climate Change opportunity. 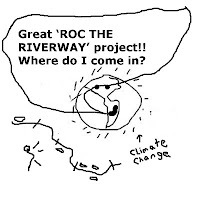 Promoted as a Climate Change demonstration, ROC the Riverway would get worldwide attention. Please consider making comment on this City project soon, with your own vision that includes a healthy viable Rochester: Go here to learn about the plan online. Go here to submit your input. Go here to join an email distribution list for news and announcements regarding this initiative.